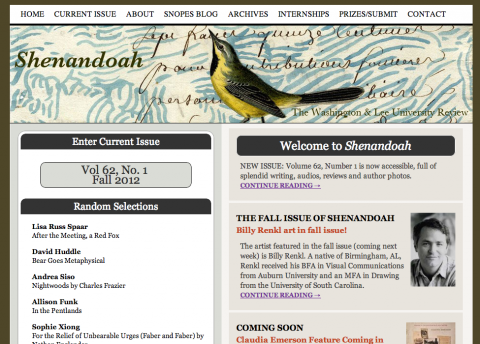 As of this past Tuesday the third, entirely online and open issue of Shenandoah is out on the virtual stands. 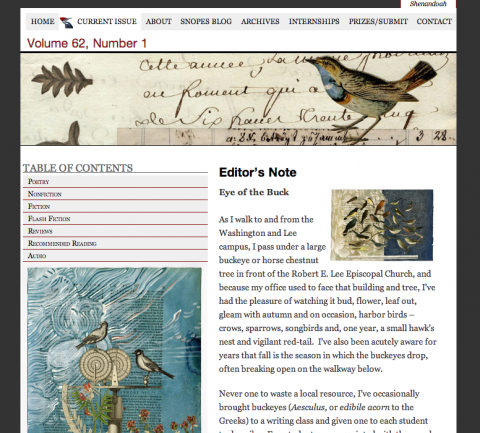 This issue features a host of impressive poetry, fiction, flash fiction, nonfiction, reviews, and recommended reading. What’s more, this issue features an brand new audio category that highlights works across all genres that have the authors reading their work aloud. While I’d like to try and take credit for how the site looks, that is all Billy Renkl. Renkl’s work adorns this issue and his aesthetic is absolutely compelling. I really love his work. In fact, Rod Smith and I liked it so much that we re-themed Shenandoah’s homepage to remain consistent with this issue’s visual theme, we just changed up the colors a bit. I have some more work to do on a few features for Shenandoah: namely making Poem of the Week postings more streamlined, including select blog posts on the homepage elegantly, and optimizing the site across all mobile devices. Being part of brining Shenandoah online over the past two years has been one of the more rewarding experiences of my professional life, and I look forward to making the platform much better over the coming years. This entry was posted in literature, Shenandoah and tagged shenandoah. Bookmark the permalink.